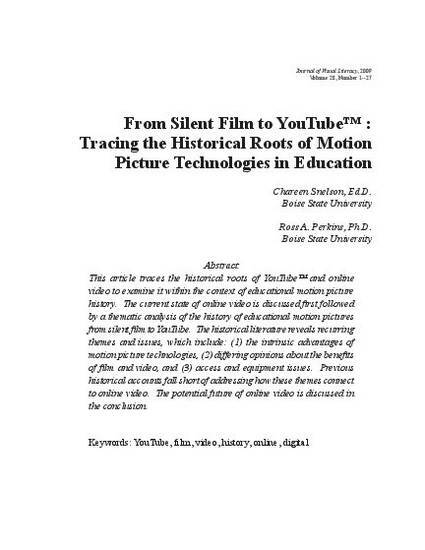 This article traces the historical roots of YouTube™ and online video to examine it within the context of educational motion picture history. The current state of online video is discussed first followed by a thematic analysis of the history of educational motion pictures from silent film to YouTube. The historical literature reveals recurring themes and issues, which include: (1) the intrinsic advantages of motion picture technologies, (2) differing opinions about the benefits of film and video, and (3) access and equipment issues. Previous historical accounts fall short of addressing how these themes connect to online video. The potential future of online video is discussed in the conclusion.